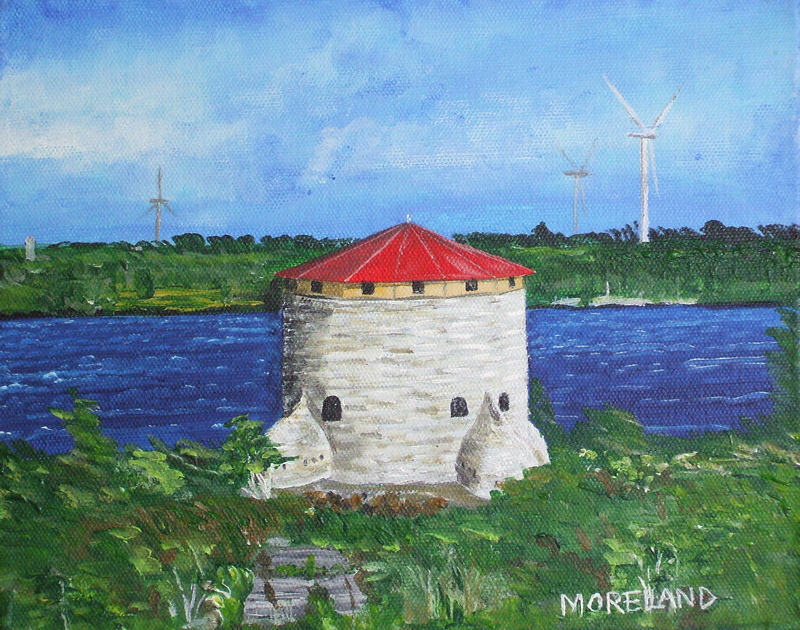 This painting is of Cathcart Redoubt which is one of the four large Martello Towers that were built along the shores of Kingston in response to the Oregon Boundary Dispute. There are also two smaller ones. All are still standing. The perspective of the image: from Fort Henry using a telescopic lens, so that you can easily see the tower on Cedar Island as well as Wolfe Island in the background. One does not see Dead Man’s Bay in this painting but it should be noted that during the building of this particular tower, 17 men perished when their boat capsized there. These men were trying to return home after a day of work; sadly, this is how this bay got its name. These towers were pretty much obsolete by the time they were built and fortunately were never needed to be used militarily. With the towering windmills behind the tower in this painting, the name Kingston’s Wars seemed to me to be appropriate. Kingston has new really seen any war but for any of you who are not local and reading this, the construction of these wind turbines caused many hard feelings and disagreement between neighbours. Now with them present, land values in question and still feelings running high, one wonders if the healing of this generation of islanders, will happen. I truly hope that it will.